This one is a quite easy mod, since the pedal itself is nearly perfect for fattening up a bass. in stock form it does roll off some of the low end, though (it is a guitar compressor, after all), so that bit needs fixing. 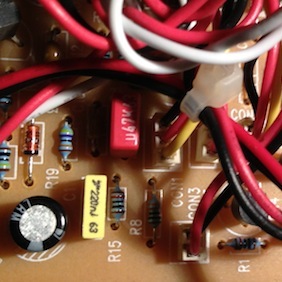 Another problem with the ED-1 is the bypass system – if you plug a passive bass (no active electronics) straight into it, the bypass tone will be quite severely compromised. As long as the pedal is kept on, though, or if there’s something active (a buffered pedal or tuner) in front of it, or if you’re using active pickups or a preamp in the bass itself, everything is ok. I’ll go into more detail about this later, but first let’s deal with getting the compressor itself to work for bass. This bit is dead simple. To get the bottom plate off, just open the battery compartment and remove the four screws that hold the bottom plate in place. From there, the circuit board can be lifted out. 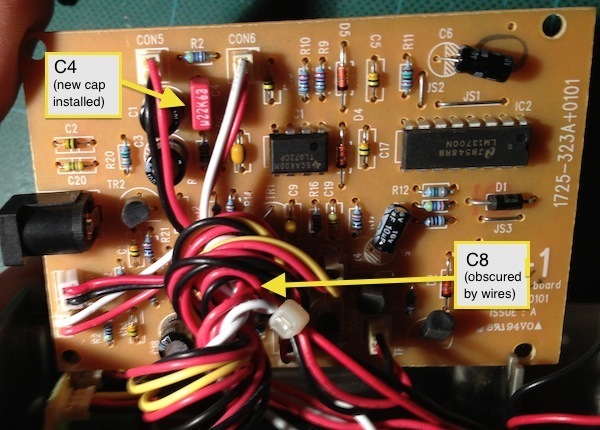 The wires to/from the main board are twisted together, so if you rotate the board you’ll get more room to work. Don’t disconnect the wires – even though they hook up with simple connectors, remembering which goes where and in which direction is tricky, and you’ll have plenty of room anyway. Once you’re inside the pedal, you need to locate and replace two capacitors. 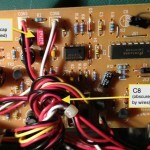 See the image above right for the component locations on the back of the board. C8 can be a little tricky to get at, since it’s located right in the maze of wires, but it is definitely doable. The wire bundle is created by spinning the whole board around, basically twisting the wires into a knot. So rotating the board too loosen the knot really helps. 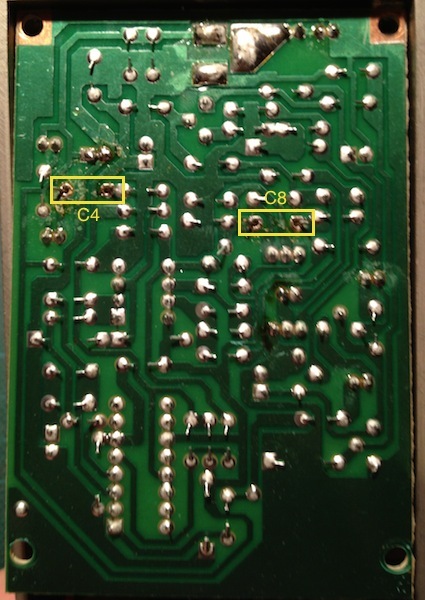 Make sure you desolder both capacitors properly, so they are fully loose, before you turn the board around and try removing them. This is especially important with C8, due to it being partly hidden by wires. 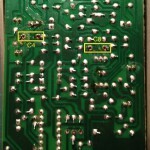 The pic above shows an overview, and to the right a closeup of C8 (it’s the big red capacitor, in case you’re wondering). The circuit board has component labels, so once you get through the maze of wires, you will find it. Once you’ve replaced the two capacitors, rotate the circuit board so the wires twist together again, and reassemble the pedal. One thing to note, though. I’ve noticed that too strong input signals (for instance from hot pickups) can cause it to distort. It’s actually something I’ve mostly noticed when playing (humbucker-equipped) guitar. I haven’t heard it when playing bass, but if your bass has fairly high output pickups, this pedal might not be for you. What about the bypass bit?